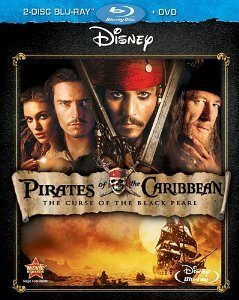 Pirates of the Caribbean: The Curse of the Black Pearl DVD/Blu-Ray Combo Only $5.99! You are here: Home / Great Deals / Amazon Deals / Pirates of the Caribbean: The Curse of the Black Pearl DVD/Blu-Ray Combo Only $5.99! Any Pirates of the Caribbean fans out there? If so, you’ll want to hurry over and get Pirates Of The Caribbean: The Curse Of The Black Pearl (Three-Disc Blu-ray/DVD Combo) for only $5.99 (reg. $20)! Get FREE Super Saver Shipping on orders over $35 or FREE 2-day shipping with Amazon Prime.